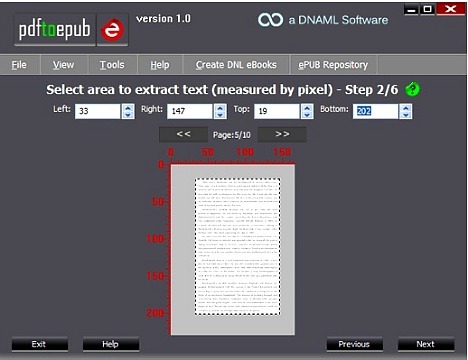 PDF to ePub Converter is an easy to use converter software from DNAML that is designed to convert eBooks from PDF to ePub format. PDF to ePub Converter comes with simple user friendly interface with “Step by Step” wizard, and it supports batch converting. With PDF to ePub converter, users able to view eBooks on iPad, iPhone, iPod Touch, Sony Reader or other eBook Readers with supporting ePub format. In addition, PDF to ePub Converter provides user the option to overwrite glyphs utilized within the PDF, custom characters, set DPI (resolution) for images, and convert PDF to HTML allowing the digital books to publish as web pages. PDF to ePUB Converter normally cost $39.95 per single license. 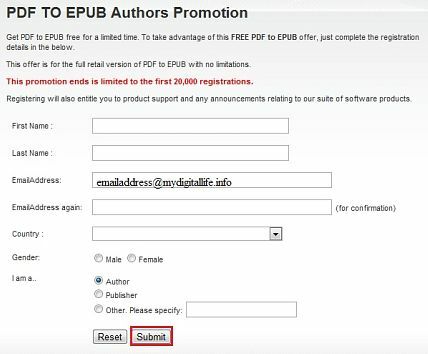 As part of promotional offer, DNAML Software is giving away 20,000 free copies of the full version PDF to ePUB Converter. Fill in the form by enter the name, email address, and other information, and then click on “Submit” button. Once finish register, the page will forward to other page which containing the link to download the setup installer and license key code for PDF to ePUB Converter. Install PDF to ePUB Converter and enter the activation key to enjoy the fully licensed PDF to ePUB Converter. PDF to ePUB Converter supports Windows Server, XP, Vista, and Windows 7 (or MAC using Windows in Parallels/VirtualPC).